Update* Louisiana State Police have identified the driver and passenger involved in a high-speed pursuit that ended in Lafayette earlier today. The driver is identified as 35-year-old Keith Anderson Harris of Jeanerette. The passenger, identified as 28-year-old Qwayland Michael of New Iberia. Louisiana State Police have issued the following statement. belt. 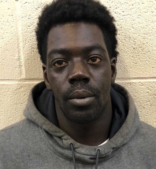 Harris was processed at the Lafayette Parish Correctional Center before being transported to Lake Charles and booked into Calcasieu Correctional Center. Qwayland was arrested and booked into the Lafayette Parish Correctional Center for resisting by flight and for an active warrant. Original Story* (KPLC) – A driver and passenger have been arrested after a police pursuit on I-10 eastbound that ended in Lafayette, according to Tpr. Derek Senegal, Public Information Officer for LSP Troop D.